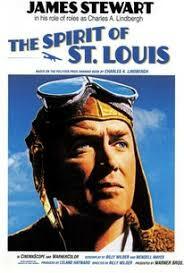 On Monday, July 1st we'll be watching The Spirit of Saint Louis (1957, 138 minutes, PG). This lauded biopic follows legendary pilot Charles Lindbergh (James Stewart) as he makes his historic solo transatlantic flight from New York to Paris. The film details earlier events in Lindbergh's aerial career, including his stints as a stunt pilot and a flight instructor, but it focuses largely on his dangerous journey over the Atlantic Ocean in his signature monoplane, the Spirit of St. Louis. Battling the elements and sleep deprivation, Lindbergh struggles to make a safe landing in France.